Drop The Hammer Trail is one of the best trails you’ll find in the midwest, located at the Coler Preserve in Bentonville Arkansas. 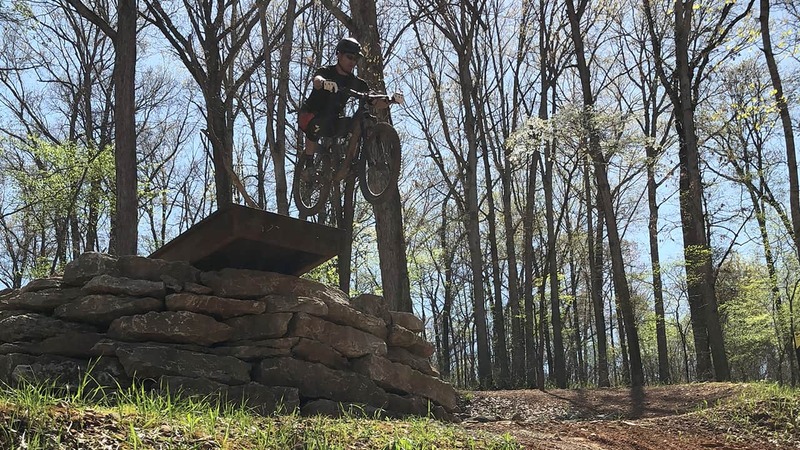 Coler’s mountain biking trails currently include sixteen miles of trails and growing, with the latest addition of the Dual Slalom Trail in Coler West. Riders can grab an adrenaline rush with the Drop The Hammer line, which is a great session spot. As Gary Vernon calls Coler a “unique and pioneering gathering grounds” for the mountain-biking community. Riders can start this line at the first feature and flow into the first drop, which is a long metal grate with plenty of time to setup. This, at ten to twelve feet by the time the rider’s tires are on the ground, speed is at its max through the flat to setup for the large second feature, the step up. If the rider clears the step up feature smooth, the first berm is designed just right coast through to the second drop in this sequence. With a smooth landing off of the second drop feature, the rider will again, find that max speed to setup for the third features in the Drop The Hammer sequence, another step up. At this point the adrenaline is at its highest, and adding a few pedal strokes cannot hurt to guarantee cleaning this next setup successfully. The berm is setup just right to coast through the feature to setup for the last and final feature of the sequence, the final drop. The final drop does not seem as high as the first, but a rush nonetheless. This, constructed of large wood timbers, provides a slightly different feel in the approach, compared to the steel grate of the first drop, and all dirt approach of the second. Landing into the sweet spot of the dirt transition completes the sequence, and there is only one thing left to do. Head back to the to and shred Drop The Hammer again.